It's back to the minor leagues again for San Francisco Giants third baseman Hwang Jae-gyun. The Giants demoted the slumping South Korean to Triple-A Sacramento for the second time this season on Wednesday (local time), and designated another third baseman, Conor Gillaspie, for assignment. They called up prospect Ryder Jones, who can play third base and outfield, from Sacramento while activating outfielder Jarrett Parker from the disabled list. Hwang was called up to the majors for the second time last Friday, after spending six days in the minors. 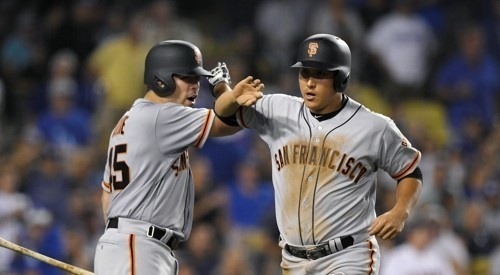 In five games back with the Giants, though, Hwang batted just 2-for-16. He sat out the Giants' most recent game against the Oakland Athletics on Wednesday. After 10 years in the Korea Baseball Organization, Hwang signed with the Giants in January and began the season in Triple-A. He was called up on June 28 and homered in his first big league game on the same day. But by the time of his demotion, Hwang was batting .167 with a home run and three RBIs in 13 games, including a 6-for-36 slump in July.